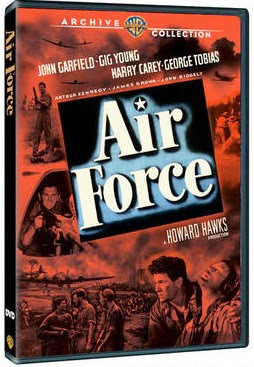 Rupert Pupkin Speaks: Warner Archive Grab Bag: AIR FORCE, ZANDY'S BRIDE, FRONT PAGE WOMAN ""
Make no mistake, I believe Howard Hawks to be one of the greatest directors in the history of cinema. So nothing gives me a greater thrill than seeing "A Howard Hawks Production" card pop up on screen. Hawks was one of the first directors I learned about in my first film class in college. He was always used an example of "Auteur Theory" and it's easy to see why. His theme of professionalism ran through most of films and could be seen pretty easily when one examined his work. That was just one aspect of his "directorial stamp", but one that really helped me understand what auteur theory was all about. Over the years I've come to see auteur theory as less and less of a legit thing as so many films are such a giant collaboration between so many people. I do still believe there are some auteur types out there though(Wes Anderson, Quentin Tarantino..), and it's always pleasing to see them do what they do. Another credit I love to see is "Director of Photography - James Wong Howe". He is one of the great cinematographers ever in my opinion and his films are always a treat for the old eyeballs. This particular story deals with a B-17 bomber(dubbed 'The Mary Ann') and her crew during World War II as they fly into Hawaii in the aftermath of the Pearl Harbor attack. It's a great ensemble piece and one of the better "Why We Fight" type movies out there. Hawks brings less sentimentality than most to this kind of narrative and it helps make the film stand out. The cast is strong too. John Ridgely, (a very young)Gig Young, Arthur Kennedy(who I've come to appreciate more lately), Harry Carrey and John Garfield make up most of the ship's crew. From Warner Archive: "Respectable spinster, American stock wants life in the West," the ad proclaimed. "Wishes to Mary, Reply P.O. Box 192 Minneapolis, Minnesota." Zandy Allen replied, then met his bride. Years before his award-winning performance in Unforgiven, Gene Hackman played another rugged Westerner in Zandy's Bride, directed by Jan Troell (The Emigrants). 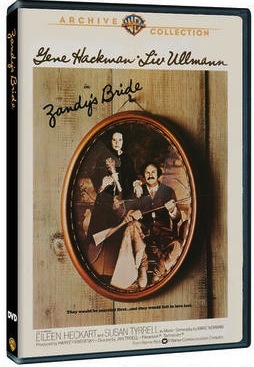 Scraping by on his Big Sur ranch, Zandy (Hackman) invites mail-order bride Hannah (Liv Ullman) into his narrow world. Hannah wants a home and roots. Zandy wants a son and heir. Love does not enter the equation. But, grudgingly and fitfully, respect will. Zandy's life is coarse and violent: tending cattle, going knife-to-claw with a grizzly and often mistreating his wife. Hannah endures his cruelty, then takes an unbudging stand. Wrestling a bear was easy compared to this. To reclaim his bride, Zandy must do what he's never do before. He must change." I am quite familiar with Gene Hackman's work and he is one of my favorite actors of all-time. This was that rare film of his that I'd not even heard of before WAC released the dvd. Zandy Allan is a much more boorish, less sophisticated frontier version of Harry Caul(Hackman's character from THE CONVERSATION). Less paranoid too, but more stubborn. The movie was a little tough for me I must admit. Though I completely understand that women were treated harshly in this period and that it is probably historically accurate, I still was made quite uncomfortable by some stuff throughout the movie in regards to how Liv Ullmann's character(and women in general) are treated.. I have no issue with the performances of either Hackman or Ullmann(both are excellent), however the unkind treatment of women is kind of a hot button issue for me. I have two younger sisters and a strong-willed mother in my life. Also my wife is quite a strong personality too, so I can't help but think of how they would have been treated during this time and it inevitably takes me out a bit. I do understand that this story is about one man's journey to change his ways and his views of women and I certainly appreciate it's conclusion, but it's a tough sit for me nonetheless. It may bother other folks considerably less. A few things that helped this movie out were some nice supporting performances by Susan Tyrrell and Harry Dean Stanton(another favorite actor of mine). I just can't get enough Curtiz films. I am happy with my pace of slowly working back through his career and WAC has helped me with that pace by regularly putting out more and more Curtiz.This film gives one an immediate sense of Deja vu right off the bat. The setup is very much like HIS GIRL FRIDAY(but it's overall more of a detective/investigative story). Though this film came before that one, we all know it to be based on Hecht & MacArthur's play "The Front Page" which was first produced in 1928. Hard to not see it as an influence on this film, even if this film is less comedic. It's kind of less everything though and certainly can't hold candle to HGF in any regard. For one thing, Bette Davis' character is not nearly the charming, charismatic bulldog that Rosalind Russell's Hildy Johnson is. She's not nearly assertive enough, at least in comparison and it makes the film just feel unbalanced. That, topped by the fact that George Brent's character is an out and out chauvinist, doesn't help things at all. Sure, Cary Grant's Walter Burns is certainly something of a chauvinist himself in HGF, but at least he's also got some charm and charisma to help make the guy more likeable. Unfortunately, Brent has never been all that high in the charisma department as an actor(at least in my experience with him) so he just pushes the movie in an irritating direction for me. In fact, all the men are kid of dicks in this film. At a certain point it just comes off as mean. I understand this a film that is of its time and is a sort of "battle of the sexes" thing, but it turned me off. Curtiz of course adds some nice directorial touches as he always does, but it's not enough to save the film tonally and otherwise in my opinion. Close but no front page.